This belt drive drum fan is one of our top of the line barrel fans that we have to offer. It offers a top air movement of 13,000 CFM, while only pulling 6.8 amps and putting out 68 decibels of noise. The side mounted switches protect them from outside forces in warehouses and manufacturing facilities. The only model that we have in this category within the same size limits, which is more powerful, is our air blower barrel fan. All other fans will not provide the same amount of air movement in a 42" fan. Blades, guards, and mounts are all made from powder coated steel for long-life. The 2-speed 1/3 HP motor is belt driven to maximize accessibility and durability. Powerful motor only pulls 6.5 amps, while kicking out 13,000 CFM or air movement. 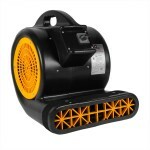 Belt drive drum fans keep areas cool and move large amounts of air in all areas. ETL & OSHA approved for use in the work place. This is a review for the Belt Drive Drum Fan.